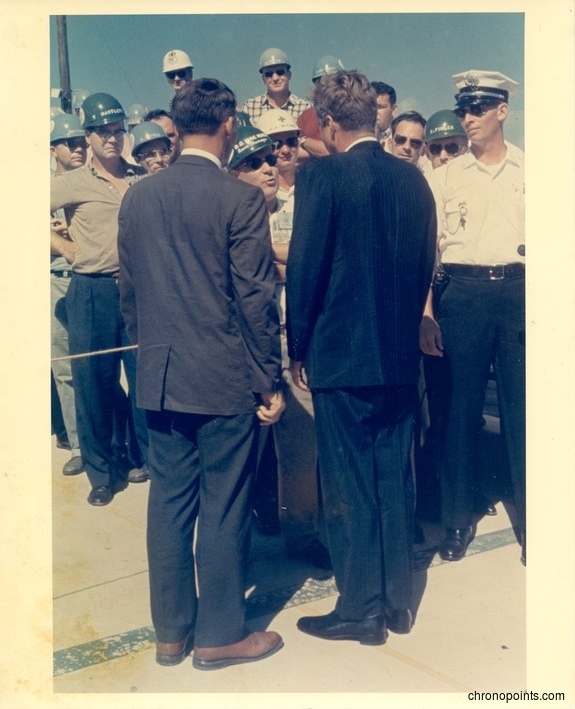 During one visit to the Cape Canaveral Air Force Station Launch Complex 14, President John F. Kennedy (1917-1963) talking with General Dynamics/Astronautics director of operations B. G. MacNabb. Launch Complex 14 (LC-14) manager Dr. Calvin D. Fowler can be seen to the right, behind the police officer in the foreground. 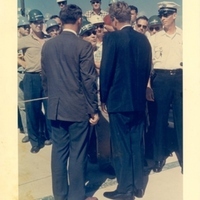 “President John F. Kennedy with B. G. MacNabb at Cape Canaveral Air Force Station Launch Complex 14.” RICHES of Central Florida accessed April 18, 2019, https://richesmi.cah.ucf.edu/omeka/items/show/4997.